Elliot Ness got me interested in old cars. As a young child I remember watching Elliot Ness and his federal agents chasing gangsters on the "Untouchables" on TV. I really liked the cars that Elliot Ness and Al Capone drove. I remember thinking it would be cool to get an old car someday, modernize the drivetrain, steering, and brakes, and cruise around in it. I later found out those kinds of cars were called hot rods. I never had a place (until recently) where I could work on an old car. I have always owned and loved trucks. Except for a brief period when I had a $100 Dodge. But that's another story. My current daily driver is a 1985 Toyota 4X4 pickup. I really love it, and it has been a good truck. However, it has lots and lots of miles on it. And lots and lots and lots of rust. A couple of years ago while I was looking at the road through the fenders and bed, I decided I needed a new truck. The rust holes were large. I could throw a softball through the fenders and drop a basketball through the bed onto the ground. The front fenders also were starting to rust through. I was convinced that the bed was going to fall off any minute, so I visited my friendly local Toyota dealer. Visiting a car dealership is always exciting. I park in front of the building in full view of the showroom, get out, begin looking at a new truck, and start counting to 10. Before I get to 10, a salesman always comes running out, gold chains flying in the air, asking what it would take for me to drive one of these babies home today. (They generally don't like it when I tell them that if they give me the truck for free I would drive it right home.) I looked around and found a really nice truck. When I saw the $22,000 sticker price, I went into cardiac arrest. I have owned and liked Ford trucks (I own four Ford trucks at the moment), so I went over to the Ford dealer thinking a domestic model would be less pricey. Wrong. About the same time I was driving down a four-lane expressway I travel once in a while and noticed a field a few hundred feet from the highway where a bunch of old cars and trucks were lined up. Then a sign appeared announcing that the vehicles would be auctioned off. I figured out how to get to this field, not an easy task since there is no direct route, looked over the cars, and decided I would purchase the 1940 Ford coupe at the end of the second row. I showed up on auction day with a lot of other people. There were many cars there to be auctioned that were not parked in the field before. Only four cars had a reserve. The rest were to go to the highest bidder. The first to be auctioned was a 1960 Ranchero, which did not have a reserve. The high bid was $800. The owner of the cars refused to sell it for less than $3000. A fight started between the owner, the bidder, and the auctioneer. Next car, same thing. By the fourth car no one would bid. Seems as though the owner was out to make a million bucks and the crowd was there for bargains. Things got ugly, and I left. All of the cars are still there. I had made up my mind. I was going to get an old car and make it live again. This was something I wanted to do for my entire life and the time to do it was now. After doing some reading and talking to some folks, I became convinced that a pickup truck would be an easier project than a car for a complete novice like me. And besides, I did need a new truck. And so I decided to build one. The search was on. 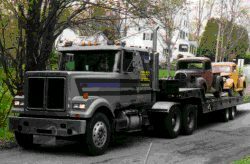 I went to a few truck and hot rod shows and decided on a 1935 or 1936 Ford pickup and started actively looking for one within a reasonable driving distance from my house. In two years of searching I found several of them for sale. All of them were badly rusted out. None had a bed. One was in two piles of parts in different locations. The metal-working skills needed to bring one of these rust buckets back to life were well beyond my abilities. And the asking price of some led me to believe that the owners mistakenly thought the rust hid solid gold underneath. My brother-in-law Kenny told me that a relative of the wife of one of the guys he worked with had a couple of old pickups. 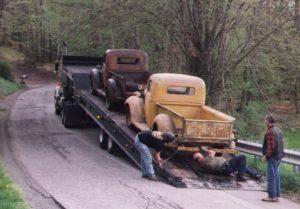 He thought they were a pair of '37 Chevys. After badgering him for about 9 months to check it out and get me a phone number, he finally did. The trucks were in the Pocono mountains about 120 miles from my house. I drove up and checked them out. They were a '38 and a '39 Ford. The '38 was in good shape, but the rust on the dipstick was not encouraging. The '39 had no engine, transmission, radiator, or interior and was pretty rusty. But the '39 had the parts missing from the '38. I made the owner an offer for the pair and she accepted. I found someone with a flatbed trailer, and he hauled both of the trucks to my house at the same time. And that is how I got my trucks.